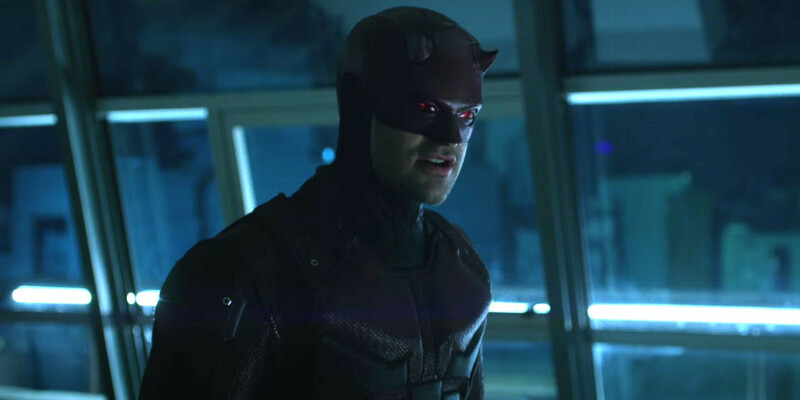 When season 1 of Netflix series Daredevil premiered, it immediately set itself apart from the current crop of superhero shows. While a dark, edgy tone isn't new to the genre, the realistic, grounded take on Marvel's blind vigilante was a refreshing spin. Despite the fantastic feats of skill and strength, Matt Murdock (Charlie Cox) felt pain, he bled (profusely), and he often needed help out of dire situations. That realism was carried through every action sequence, which were the exact opposite of flashy, colorful, CGI-enhanced spectacles. Fans found them jaw-dropping because of the strength of the character's will at overcoming human fragility. Viewers could feel the thud of every punch, while admiring each acrobatic leap that could end in dominance or disaster. Nothing exemplified this better than season 1's famous one-take hallway scene, with a battered and exhausted Daredevil cutting his way through a horde of opponents to save a kidnapped boy. The showrunners knew Daredevil season 2 would have to find a way to top a scene like that. While there are several good candidates, the most obvious homage is the long-take stairwell fight scene from episode 3, which you can now watch above. There are some minor spoilers in the set-up if you haven't watched that far in the series yet, but the scene boils down to Daredevil fighting a succession of Dogs of Hell bikers while The Punisher (Jon Bernthal) lies unconscious in an elevator. In what seems like a smooth, continuous take, the Devil of Hell's Kitchen saves an innocent bystander, then fends off the fists, guns, and baseball bat swings of his biker attackers. Part of the brilliance of this scene is how Daredevil uses a length of chain and an inconveniently empty gun taped to his hand, the remnants of his rooftop altercation with The Punisher, in a succession of unique ways to lasso, whip, and beat his opponents into submission. While this extended sequence has room for cuts and some visual tricks, its one-take feel is still as exhilarating as the season 1 hallway battle. The way the camera work pulls us in close to the fight adds to the claustrophobic, no-way-out-but-through feel of the scene. The subtle touches, like Daredevil sitting down on a vanquished biker for a rest, add doses of realism and humor the series does so well. Murdock slamming the door repeatedly on a victim amusingly calls back to Wilson Fisk's enraged murder of a Russian by SUV in season 1 - and the way Daredevil extricates himself from a seemingly unwinnable dilemma is the perfect finish to this spectacular clip. The stairwell sequence also dramatically illustrates the thin line Daredevil dances on in his ongoing fight to avoid outright murder. While he doesn't blast though his enemies with an assault rifle, he definitely isn't afraid to use any other weapon at his disposal to deal out some hospital-grade beatings. Daredevil season 1 & 2 and Jessica Jones season 1 are now available on Netflix. Luke Cage season 1 will arrive on September 30th, 2016. Release dates for Jessica Jones season 2, Iron Fist, and The Defenders on Netflix have not yet been announced.